Over twenty-five hundred people with an average net worth over $7.5 million just revealed how they invest their money and the answer will shock you. The rich don’t become wealthy by investing in stocks and the investments they do have aren’t the high-risk, high-return most people think. By the end of this video, you’ll know the secret to how the rich invest to get rich, how you can get started and how much you’ll make. Join us on YouTube for all the best videos about beating debt, making money and making your money work for you. You’ll love the sense of community we’re building and we’re working hard to create the financial future you deserve! We’ve got a great video planned today, in fact it could be one of the most important videos you watch on building wealth because I’m going to show you how the rich actually do it. Now when I say that, your first reaction is probably, it’s another investing video, just another video on stock investing but that’s the single biggest myth in becoming rich, that it’s about stocks. In fact, I’m going to show you exactly where the rich put their money and I’ll tell you right now, very little of it is in stocks. We’re going to look at each investment they make, how you can use this knowledge and how you can make these same investments. I usually don’t post investing articles on the site but this isn’t really about investing. It’s about using your money in the best way to make you wealthy. A couple of years ago, asset managers Scorpio Partners and BNP Wealth Management reached out to over 2,500 of their wealthy clients about where they put their money. These clients were from 17 different countries and had an average net worth of $7.6 million, that puts them right at that top 1% in terms of wealth and about 100-times more than the average household. So this was a special opportunity to see exactly how the rich invest. We all know that the rich are just getting richer but this is how they’re doing it. And like I said, the truth is going to surprise you because it’s not in what you hear on TV or online. I’ll show you the results next but they found that the rich actually have less in stocks than they do in bonds or cash. In fact, their money in stocks is more of an afterthought, it’s a place to keep the money they don’t know what to do with. It’s this knowledge, what I’m going to show you that is going to change the way you think about building wealth. I’m going to reveal the true secret of the rich and how you can truly become wealthy. So let’s look at the results. Remember, this is 2,500 people with an average wealth over seven and a half million dollars. Each row is the percentage of their wealth they have in different assets including their own business, stocks, bonds, cash, alternative investments which is mostly real estate and investing in startup companies. The columns give us a look at how the rich invest around the world, so we see the average then it’s broken down by how the rich make money in the U.S., in Europe, China and the Middle East. Look at how much the rich have in stocks, that first average column, less than 20%. That’s compared to 21% in bonds and over 25% invested in their own business. This is the secret of the rich. They’re not sitting around watching CNBC. They’re not trying to pick stocks that are going to make them rich, hoping that the management of those companies will grow the stock price. The rich don’t wait for someone else to make them rich! On the Forbes billionaire list, not one of them is there because they invested in stocks. Zero. Every single one made their money by creating their own business or investing in a startup of someone else’s business. 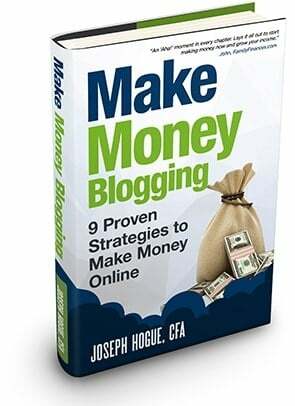 I’m going to go through each source, how to get started and how much you can make with these millionaire money-makers. Let’s look at the survey again though because I want to make a few more points before we go through each source. First is that idea that the rich have very little in stocks, actually more in bonds and cash. Why do you think that is? Why is 90% of what you hear about making money about stocks but then we find out that the rich barely even use them? It’s the idea of managing the risk in your wealth and this is a very important idea. This is something the rich pass down through their families while everyone else throws money at stocks. Between their own business and startup investments, the rich have more than a third of their money in risky investments. Anytime you’re running your own company or investing in a new company, you’re taking a lot of risk. That means you don’t want the rest of your money in other risky investments like stocks. If the economy hits a rough patch, you might need cash to support your business. Stocks aren’t going to help you. We hit a recession and stocks crash. So the rich park their non-business money in bonds and cash for that rainy day. That 40% the average rich person said they had in bonds and cash, that’s over $3 million for the people in the survey. Now that $3 million might only be earning three or four percent a year even in bonds. So why are they sacrificing the ability to make 8% to 12% in stocks with that money? Because they know that as long as they can ride out the rough times on their own business, they’ll make thirty-, forty-percent or more a year. The rich make themselves rich. We also see that there’s some difference in how the rich invest across the globe. The wealthy in the U.S. have much more in stocks but still the majority in their own business and in startup investing. The reason for the difference is mostly due to how well the stock market works and faith in institutions in the U.S. versus other regions but that overall idea is still the same even for the rich in America. 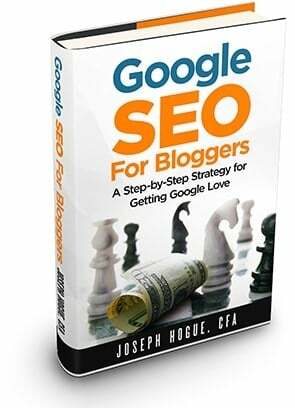 So now let’s look at each source from the table, how you can get started and how much you can make. The most important one here is creating your own business but I don’t want to call it that. I think a lot of people are scared talking about creating a business like they need to be creating the next Amazon or Google. This can be something as simple as freelancing online, starting with just a few hours a week doing projects for people. You can put up a basic website in about 15 minutes, we’ll look at a few ideas for businesses and you can be making money in less than a week. Once you’ve started, you’ve got an asset that is going to be generating cash flow, that’s going to be creating wealth forever. That’s powerful. That means you’ve got something working for you instead of always having to work for someone else. Now I’ve got a few videos planned specifically for different business ideas and how to get started in each so be sure to subscribe to the channel so you don’t miss those. 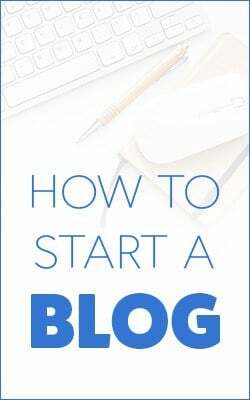 I’m going to be going step-by-step into different ideas and business strategies you can use that don’t require any startup money or experience. There are literally hundreds of small business ideas you can run with and most can be managed in less than five hours a week. We’ll be talking through some of these in that upcoming video but I want you to really think about what you like to do, what you do for a hobby and how you can turn that into extra cash. It’s another secret of the rich and something you don’t see in the investments, that they’ve found a way to make money doing what they enjoy. It might take a few extra hours a week growing your business but it’s something you’re going to enjoy, you’re going to have control of your financial future and will love the work. “The only way to be truly successful and happy is to love what you do.” Listen to what you love doing and find a way to make money doing that. Do You Still Need Stocks to Get Rich? Stocks may be a small part of how the rich invest but it’s still something you need in your wealth building plan. 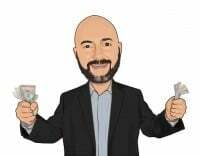 Besides a steady return and great cash flow from dividends, stocks are a good source of passive income versus that 24/7 work that sometimes goes into building your own business. Now we’ve got a lot of stock investing videos the channel but I want to talk about one very important idea here, something most investors miss and it’s going to make you a better stock investor. The How you invest is much more important than the what. You see, investors spend all their time trying to pick stocks, watching CNBC or following their favorite investing blog. What happens is they end up trading in and out, they miss those big long-term returns and they lose thousands to commissions. Because of this, the average investor earns just 4% a year. That’s four percent versus the long-term return on stocks of 8% and even a 5% return on bonds. Instead of the what, those stocks you pick, I want to share with you my favorite investing strategy. This is the how of investing that is going to boost your returns, save you thousands in fees and really just give you a stress-free way to make your money work for you. The strategy is called core-satellite. The core-satellite strategy means putting the majority of your portfolio, maybe 60% to 70%, in broad exchange traded funds. These funds invest in hundreds of individual stocks within a theme or a sector so for example you have the Vanguard Real Estate Fund, ticker VNQ, which invests in companies that own commercial properties. Another example would be the Technology Select Sector SPDR, ticker XLK. The fund holds shares in 76 of the biggest tech names like Apple, Facebook and Google. It pays a 1.3% dividend yield and has returned over 14% a year over the last decade. So you build out the core part of your portfolio around these funds that give you instant diversification. You don’t have to worry about any single company crashing and destroying your portfolio but you get solid returns from the group. Then you take the rest of your money, that thirty or forty percent, and put that in individual stocks. Pick the top ten stocks that you really believe in. By limiting your stock picks to just a handful, you’re only able to invest in the very best, the ones with the most potential. Since that individual stock part of your portfolio is only thirty percent of your money or so, none of these individual stocks are going to be more than three to five percent of your money. That means none are going to drag your portfolio down too much if they don’t work out, but they can still add to your overall returns. Bonds are the most under-rated investment for most investors. They pay reliable cash returns and offer the ultimate protection from a stock market crash but investors give them no love at all. Well, regular investors anyway. You see in the survey that the rich actually put a fifth of their money in fixed income. That’s a big chunk of money and these bonds take a lot of the risk out of the portfolio. When stocks crash, the rich can use their bonds to snap up shares on the cheap when everyone else is rushing to the exits. The regular cash payments from bonds, that coupon payment twice a year, can be used to support cash needs for the business when times are tough. The great thing about bonds is they’re so easy to invest in, even easier than stocks. That’s because unless you have a hundred grand or more to invest, your best bet is just to buy a few funds that hold types of bonds. Buying individual bonds can get expensive but these funds completely diversify your fixed income portfolio and give you all the exposure you need. I’m going to cover two bond funds I use in my portfolio, two funds that will give you the safety of bonds and some solid returns. I’ll also link here to a bond investing video on the channel. It goes into more detail on returns you can expect and different types of bonds. First is the iShares Core US Aggregate Bond ETF, ticker AGG. This is probably one of the safest and most diverse bond funds with two-thirds of its holdings in government or government agency debt but it still has some corporate bonds to increase that interest rate. The next bond fund I like is the iShares High Yield Corporate Bond ETF, ticker HYG. This is a group of almost 1,000 of those bonds from companies with less than perfect credit but guess what, it’s still a safe investment. With the investment spread across a thousand companies, even with the 2008 crash, the fund has returned more than 6% annually over the last decade. 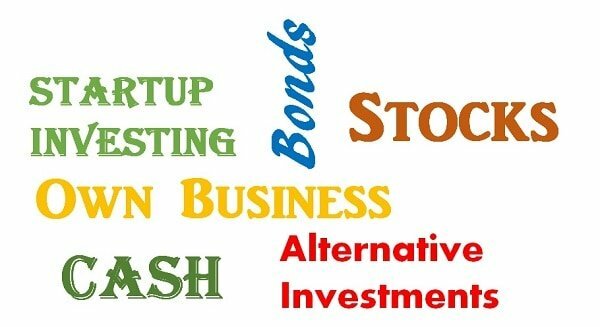 There are hundreds of bond funds and you can get into things like international debt, emerging markets and some other interesting choices but these two funds are what I use for most of my investment. Can You Become Wealthy Holding Cash? Cash isn’t an investment. Even cash in money market accounts and short-term treasury bonds only pay around 2% a year. That’s basically just keeping the value of your money after inflation. So why do the rich hold nearly a fifth of their money in cash? Here we get back to that idea of risk in your overall wealth and how to balance that out. The rich have a huge amount of risk in their own business and in those startup investments. 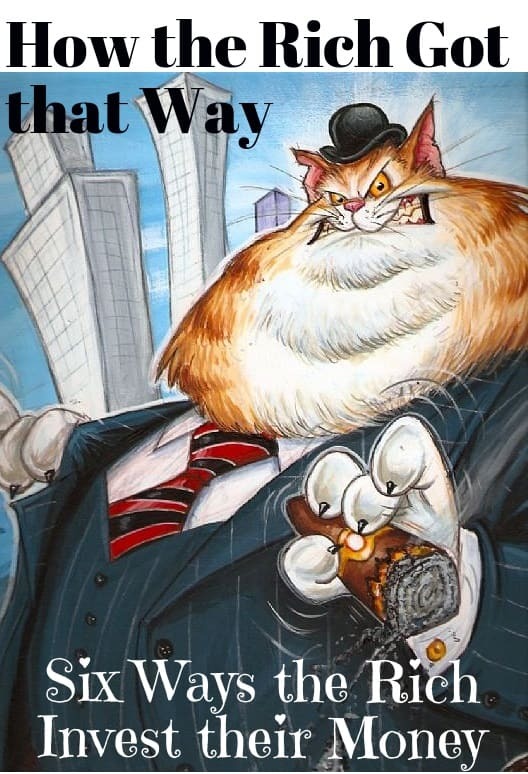 They can afford to let some of their wealth sit there making 2% because they’re doubling that 25% of their wealth every year by growing their business. When times get tough, when a recession hits, they know they have the cash to pay the bills and support their business to survive until the good times return. Now I’m not saying you need 20% of your money as cash, especially if your business doesn’t require a lot of expenses. Say you’re managing websites or a YouTube channel, then it’s not about having the cash but just the time to make those work. Here I think the old rule of having three to six months’ worth of expenses for an emergency fund is a good idea. That means not only living expenses but cash to support your business as well if it comes to that. It might mean 5% of your wealth, it might mean 15% but don’t neglect holding something in cash to lower that risk in the rest of your portfolio. Alternative investments aren’t a big part of how the rich invest, between 5% and 10%, but they’re an important part. When we say alternative investments, we mean things like real estate, hedge funds and private equity. They’re called alternative because it’s a different set of factors compared to stocks. Alternative investments might not be as easy to buy or sell as stocks, they’ll have higher fees and might lock your money up for a few years before you can sell. That said, every investor should have some real estate exposure. Owning real properties is going to protect your money from inflation, it’s going to generate stable cash flow and it’s going to protect your portfolio when stocks crash. I started my professional career as a real estate analyst just out of the Marine Corps and have held rental properties for over twenty years so real estate has always held a special place in my portfolio. The big problem here for a lot of investors though is that huge down payment you need to buy property. That upfront cost can easily stretch into the hundreds of thousands. 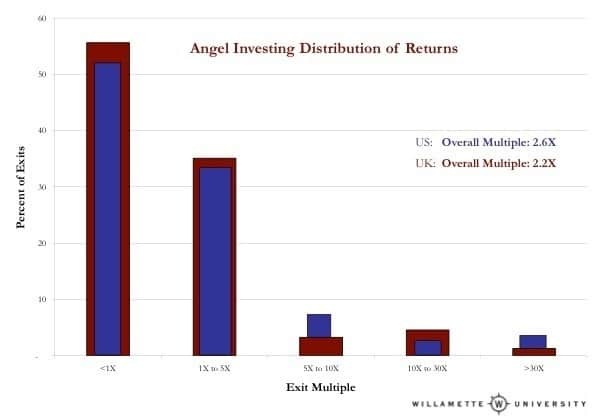 Finally here is startup investing and the rich invest about the same amount here as in those alternative investments, so between 5% to 10% of their total wealth. This is investing in startup businesses before the rest of the market, before they have stock available. And I’m excited about this one because something just changed in the last year that opens this investment to millions of investors like never before. You see, before the JOBS Act, you had to have over a million dollars net worth or make 200,000 plus a year before you could invest in these new companies. They raised money through angel investor groups or venture capital but only the rich could invest. That’s all changed now with equity crowdfunding and it’s a huge opportunity for main street investors. Research by Willamette University on more than 1,200 early-stage investments over 15 years showed an average return of 160% over any four-year period, that’s a 27% annual return. That’s almost triple the average annual return on stocks and six-times what you’ll earn on bonds. Investing in these startup companies is a lot like combining stock investing with building out your own business. You’ll look at this business like a stock, analyzing the management and financials but you’ll also look at it in terms of the business potential. You’ll also put on your business hat to look at management’s plan for the future and how they plan on building out the business. Investing in startups is easy through crowdfunding sites like EquityNet, CircleUp and WeFunder. These sites act as the broker, with early-stage companies posting on the platform for investors to review. Knowing about these six types of investments the rich use to grow their wealth, the next thing to do is decide how much of your money to put in each. I’m not going to say to follow the percentages we see in the survey. 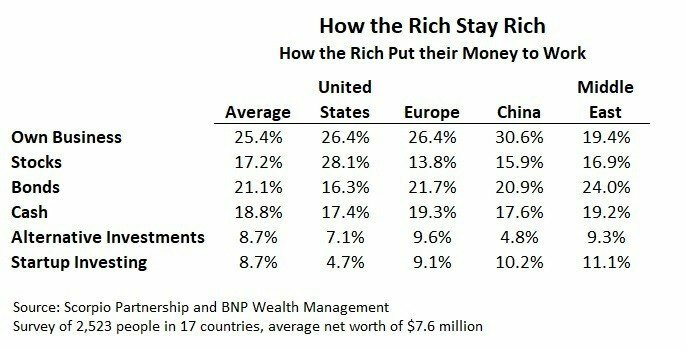 In fact, these are only averages so even the rich invest a little different depending on their personal factors. The most important idea I want you to get from this is that stocks aren’t going to make you rich. If you want that financial freedom, you have to make yourself wealthy through building a business that’s going to produce cash flow. Now the best part about the internet revolution is that starting your own business doesn’t require the huge upfront costs and continuous expenses like in the past. You can run your own business online on a budget of nothing, just the time you spend. Even in something like Amazon FBA, you might only have a few thousand in inventory costs and marketing each month so nothing compared to all the costs in a traditional business. That’s going to affect how much you have in these different types of investments but it’s not going to change the idea. You might not need quite as much in cash or bonds because your monthly expenses won’t be high but you’ll still have that business risk that you need to manage with less in stocks.